We found this excellent temperature when we parked in Cottonwood, AZ, this afternoon. We have ARRIVED, finally. Hated to skip through so much beautiful country between Salt Lake City, UT and Cottonwood, AZ. But we had finally reached our limit. We left Vancouver, B.C. and really nice weather approx Sep 12. We enjoyed a week of excellent weather in Washington state. Then we hit Idaho. The temperatures just kept getting colder and colder, day and night. We had committed to working at the Sun Valley Jazz Festival. We would have fled south earlier, upon encountering unrelenting chilly weather. Instead we stayed in Ketchum for ten days. The place is gorgeous and nice and interesting. We’re glad we stayed despite snow showers, rain, and chilly weather. The music alone was worthwhile, and we enjoyed the music and much more. A couple of days later we pulled into North Salt Lake City. We found a really excellent RV park, Pony Express, just off I-215. Very well run and nicely designed, this park is a great one and was reasonably priced (for the proximity to SLC) at $28.50. Nice showers, clubhouse, laundry, management, appearance, and location. SLC was interesting to visit. We spent all our day in the Temple Square, listening to an organ recital on the world’s fifth (?) largest organ in the Tabernacle, touring one of Brigham Young’s houses, the Beehive House, peering up at the Temple, and visiting the Joseph Smith Memorial Center (apparently a very grand hotel from 1910 until 1970). We spent almost three hours on the LDS Church’s computers peering into our past. Very interesting, the information they have collected on us all. But still it was darned cold. So south we headed. Don’t get me wrong, we understand many of you love your home location whether it becomes cold or not. We both grew up in western North Carolina and experienced a wide range of temperatures. But our present home has wheels. We choose warm weather. So we thought, anyway. We haven’t done a superb job of attaining 75 degrees. Then again, we would limit our venue terribly if we first sought 75 degrees. Our goal of helping at the Jazz Festival interfered with getting south in time to avoid freezing weather. And the Jazz Festival is totally worth it. This morning, with the windows frosty on the inside, we decided 24 degrees is just a little cooler than we have to tolerate. So southward we headed, and not by any small measure. The first hour of our drive the outside thermometer varied between 24 and 25 F degrees. We quickly decided to drive until we were in a warmer clime. We found it — Cottonwood, AZ. We could have felt disappointed to have skipped so much great territory as Zion Canyon, Glen Canyon, Bryce Canyon, and Grand Canyon. Instead, we are expecting to haunt these same areas thoroughly next April and May with the WBCCI Southwest Caravan, led by Jay and Elna Thompson and Winston and Carol Montague. The excitement of seeing all these wonders is still in store for us. And tonight we can sleep at 3,500 feet above sea level instead of 7,000 feet. It will be warmer, thank you. We’re wearing shorts again for the first time in almost a month. 75 degrees feels good! This morning, at 35 F degrees, is our seventh chilly morning yet the warmest. 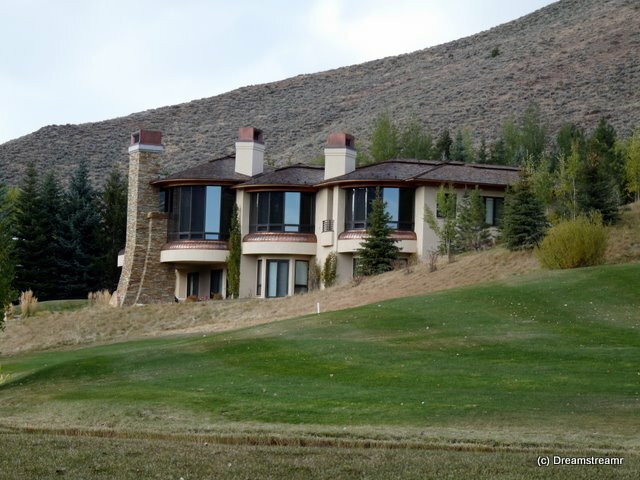 Our nine day stay in Ketchum has been remarkable for several things and outstanding among these is the weather. Sun Valley and Ketchum are beautiful, yes, but pretty darned chilly too. Our standard operating temperature has decreased to the same winter standard we maintained in our sticks and bricks home. 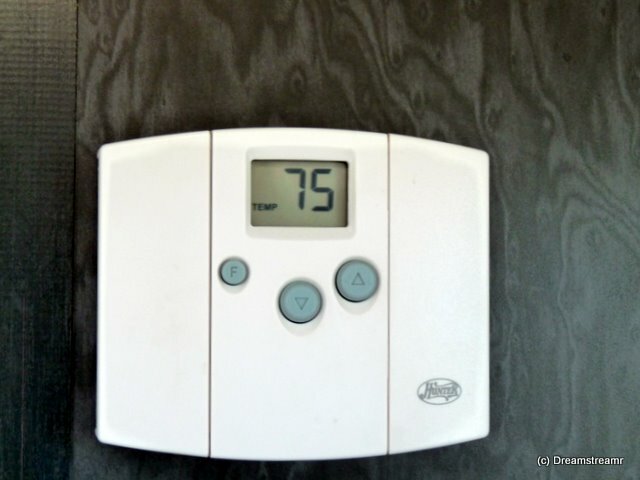 A couple of nights ago we were playing cards in our aluminum home and thinking, “68 F feels pretty warm”. It has rained on us only once, and later the same night we listened to the soft luffing sound of snow landing on our roof. The days have all warmed nicely, the sun has shone brightly, and we’ve enjoyed the nice weather. We’ve stopped our mutinous rumblings about pulling stakes early, hitching the wagon, and heading for Phoenix. Definitely we are looking forward to warm weather but we’ve adapted to this cool autumn setting. You might be asking, “What about the Jazz Festival? Aren’t they in Ketchum and Sun Valley to attend a jazz festival? Wow! The music is soooooo good, the bands are great, the performances have all been outstanding. We’ve attended one other music fest, the Galax Fiddlers Convention. The Fiddlers Convention sucked us in quickly, giving us a feel of connection with the musicians and their music. Same thing in Sun Valley, maybe more so. What’s so good about the music at the Sun Valley Jazz Festival? First, the great majority of the music is pre-1950s. The bands are playing compositions from Fats Waller, Irving Berlin, George Gershwin, Cole Porter, Antonio Carlos Jobim, Jelly Roll Morton, Duke Ellington, and many many others. Second, many of the best jazz musicians performed here this week. We’ve listened to, and watched, jazz bands from The Netherlands, New Jersey, Connecticut, Louisiana, California, and Idaho. Today, the last day of the event, we must rank the bands on our eval forms. This is tough but fortunately they allow us to have more than one favorite band. It might be even tougher if they required us to force-rank the musicians. There are so many outstanding ones on each instrument. We think we heard the best couple of drummers (John Gillick, Danny Coots), several incredible clarinetists (Bob Draga, Louis Ford, Joe Midiri), amazing trumpeters (Brian Casserly, Flip Oakes, Bria Skonberg, and too many others to name), and many other fine musicians and singers. The only thing to do is to go again. We’ll be in Arizona next month and so will the Jazz Festival in Chandler — is that near us? We’ll be finding out soon. 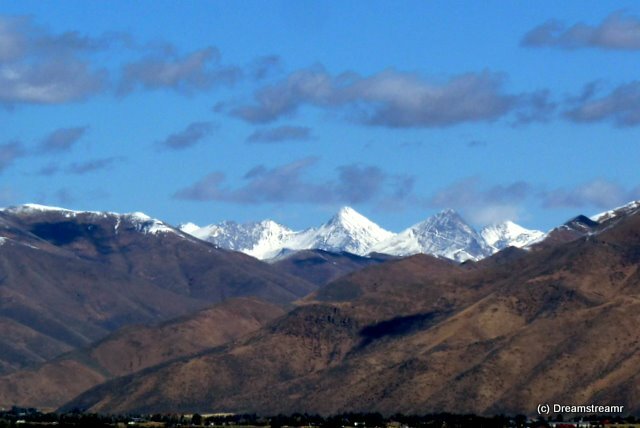 We are also making tentative plans for Mammoth Lakes and Sun Valley for 2010. Who knows, maybe they will be as great as this was? Our dry-camping experience has increased nicely with the past ten days. We stayed in Camping World’s lot the night before we arrived here. That night and tonight total eleven nights and our batteries and tanks are in great shape for more days yet. We started with 40 gallons fresh water, and we still have over ten gallons remaining. Our rinse water tank registers empty, because we only have washed and rinsed some pans and utensils, and have used paper plates. We have showered daily at the ski lodges’ excellent facilities instead of using our hot water and rinse water tank. Our black water tank registers half-full after ten days. Finally, our batteries have restored daily from solar power. We have run the generator once, for two hours, in the past five days and only for a couple of hours the nights before that. Our solar panels have been working great in maintaining our batteries. We haven’t had much extra power for things like charging the laptops or iPod. Instead we have plugged in the rechargeables while the generator is running and gotten everything charged at once. We’re encouraged by this dry-camping experience because we enjoyed these good results in very cool temperatures. Remember, our byline is Chasing 75 Degrees. We could have, and considered it, left when we found out how cool it was to be. Instead we decided this would be a great adventure. It has been. And we have learned we can do much better much longer than we thought. We’ll stretch further another time, to find our limits on dry camping. Tomorrow we head for Mesa, Az. We have only fourteen days to get there — we’ll just have to stop along the way and see what we can see. And we’ll need to put the beer in the cooler when we’re there. But until then the beer is cool enough sitting in the carton on the floor. 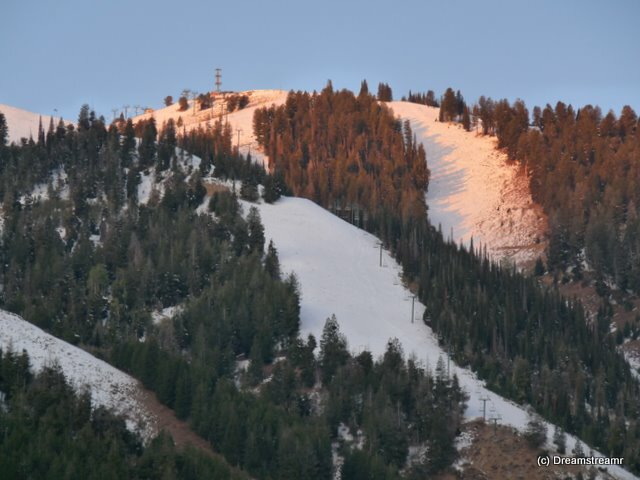 Ya don’ hafta chill it in Sun Valley in October. See ya down the road! We spent our first night in Ketchum, Id. The high yesterday was in the forties and our low temperature was 22.5 F last night. This morning all our windows are frosty, we heated the interior to a balmy 60 degrees for our Sunday brunch. Deb baked some tender and scrumptious muffins to accompany our eggs and hot tea. We’re basking in the warmth from our Wave6 catalytic heater. Several times we’ve wondered if we should have installed a Wave4 heater instead. This Wave6, even on low, can drive us outta here with its heat. Not today — sure am glad we have the 6 instead. It’s been on high all morning and feels just fine, thank you. Funny, our Club’s literature for this Jazz Festival Rally advertised warm Indian Summer week in Ketchum and Sun Valley. Apparently the copy (especially the warm part) is recycled, and they update the particulars as needed each year. A couple of people we’ve met here say they remember it was sometimes warm for the week, they think . . . No harm done — we’re glad we’re here and trying out cool weather camping. Last night we turned off the catalytic heater and set our furnace thermostat to 45 F, it’s lowest setting, to try and prevent frozen (=burst) water lines. We played cards then Rummikub after 10pm and went to bed. The furnace came on at 2am, then approx once an hour. The plumbing all works this morning! The sun is shining brightly and we’ll turn the furnace off for the day. We’re off to some of the Trailing of the Sheep activities — we’ll talk to you later. Oh, how about some pictures? Yesterday we posted text only to catch up a little on where we are. 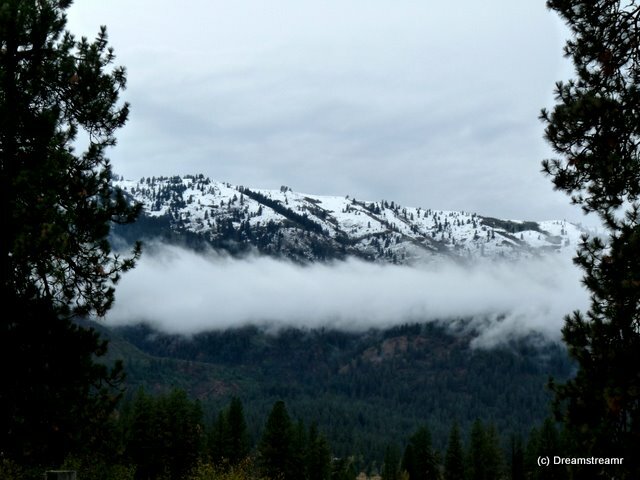 Today let’s see some Idaho pictures from our last week or so. . .
We camped at Camping World in Meridian (a few miles east of Boise) last night. They have 30amp electric at the sites, the police patrol it a few times per night, and this time (I guess it was just too cold) the irrigation sprinklers didn’t irrigate the side of our trailer. Yesterday we left Garden Valley and Bob and Faith in the mid-afternoon. 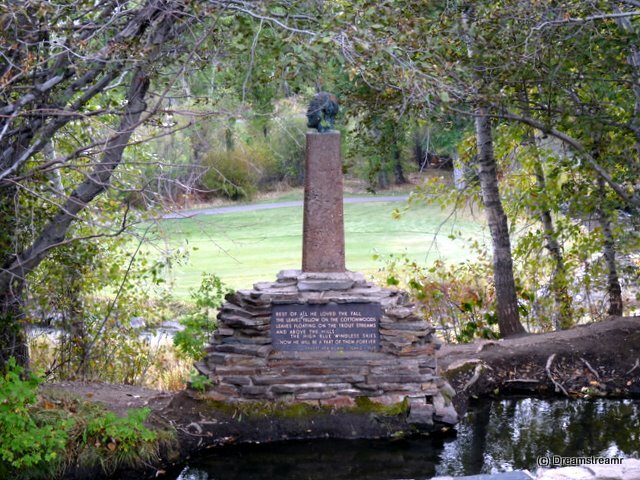 It was a wonderful stay, their park is so peaceful and nice, right against a fork of the Payette River. Bob gave us a nice tour of the surrounding areas before we left. Then we drove to Boise and Meridian for the night, hoping Camping World might have our refrigerator part (a lower control board) by now. Alas, the part is not in and they don’t really know when it will arrive. They will allow Bob to pick it up if it arrives before he heads for Phoenix. Or they can forward it to one of the six dozen Camping Worlds in the Phoenix area if it is too late. Since we already are there, we back into a spot and hook up our electrical cord to use their electricity and turn on our small ceramic heater. Then we head for our errands. These were alot of fun, to get as many errands done Friday evening as we can. Then we can awake Saturday morning and head for Ketchum. It seemed like more but we, in less than two hours, bought an air filter for the truck from Schucks, a slate tile for the oven from Lowes, foodsaver (seal-a-meal) bags from Wal-Mart, gas from Fred Meyers for the truck, and groceries from Fred Meyers. Way to go! We’ve been in Idaho for almost two weeks and haven’t been warm yet. So much for chasin’ 75 degrees, eh? Our exit plan is to hitch up and head south, toward Phoenix, Az. It’s warm there, right? But we’re looking fwd to attending the Trailing of the Sheep tomorrow downtown Ketchum and the Sun Valley Jazz Festival next week. So let’s give this slightly cooler environment a chance. We are parked in a big ski resort parking lot — sort of gravel/asphalt and slightly inclined for drainage. Today there are a dozen RVs, seven of them Airstreams. 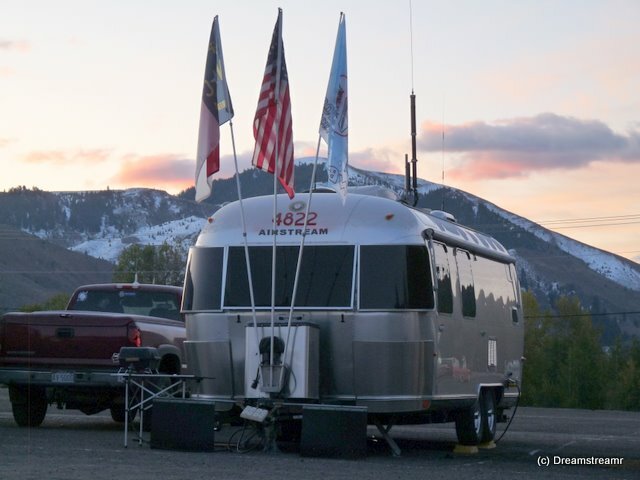 We’ve met some new people both in Airstreams and in other brands. You know, you just cannot tell the difference once they step away from their RV. . . Drove about Sun Valley and Ketchum today, just to orient and find important stuff. Found the showers and, although we didn’t have our clean clothes with us, took advantage of free availability. Wow, resort showers are just a shade nicer than national park showers. Free warm towels, body wash and shampoo, hot water without putting quarters into a slot, and really nice lotion for post-shower. Pictures after tomorrow — just wanted to get a leg up on our posts since it has been awhile. See ya down the road! That’s right, we took our backpacks to Spokane. The backpacking trip in Cascades North National Park was our first in several years. It went wonderfully but for one thing. Deb’s new backpack just didn’t work. Her backpack wasn’t entirely new — Jim bought it for her for Christmas 2006. We were already in our full-timing preparations mode, so the backpack went into the camping box with other gear. Tags still on it, the pack never filled with weight, we didn’t imagine it wouldn’t work perfectly. Hey, it was on sale and weighed almost nothing. One mile into the backpacking trip Deb’s pack straps weren’t comfortable and the adjustments just weren’t going to help enough. Whoops, we should have checked this thing out once or twice. We could have stopped in any of several REIs along the way and traded it in before we ever used it. Lucky we still have the tags, eh? Full-timing we have get lucky to time our store visits to our routes. We were on our way to Lewiston ID/Clarkston Wa from Grand Coulee. REI in Spokane looked accessible for our combined length of 45 feet (truck plus trailer). And, worst case, we could drive to a nearby Wal-Mart and drop the trailer for an hour while we visit REI. Luckily, REI’s parking lot was easy to navigate and had seven sequential parking spaces vacant. Into REI’s customer service desk we go with the errant pack. They asked what problem we had with it, accepted it very graciously, and called a staff member to help us with backpacks. Kit showed up almost instantly and ushered us into her domain. She is very knowledgeable about packs, understood well the problem with Deb’s pack, and helped Deb evaluate several new ones. Kit readily recognized Deb’s pack was wrong from the get-go — it was an oversized daypack. Yeah, a 45 liter daypack? Yep, that’s a big day, too. The problem was, the pack had pretty good capacity for overnighting but lacked decent suspension, padding, and adjustments. Kit quickly steered Debbie to three excellent choices. Debbie walked the store with twenty or twenty-five pounds of sandbags in first one, then another pack. We ended up with a 65 liter REI pack costing twice what the 45 liter one did. The new pack feels ten times better, Deb says. The entire experience was superb. Spokane was easy to navigate and, while some on-street parking made for narrow lanes downtown in places, easy to negotiate. REI’s twenty year-old store is not huge but is well laid out and nice inside. The parking lot is very easy to use, even with our 25′ trailer. Best of all, REI was wonderful about the return. Sure they have this 100% satisfaction guarantee. Seeing is believing — they didn’t fuss, harangue, or in any way make us feel more stupid for having waited three years to return a pack that wouldn’t fit. They were very welcoming and hospitable and helpful. We want to go back. What in the world is that noise? Supper just ended, we were enjoying the warm glow from great home dining. Sit and talk a while, and relax before we start the things we need to do next. We can do dishes, update the blog, play a few hands of cards, maybe enjoy ice cream and fresh-baked oatmeal-raisin cookies. But first let’s just sit awhile and talk. We are parked in a Camping World, Boise, service/sales courtesy area. Pretty nice, this “camping” area. We have 30/50 amp service (much more than we can use), a level site, cannot see the Interstate I-84 and are a block away from the city street accessing this lot. Our RV is tucked between a slightly taller and longer trailer for horses and a much taller motor home. This feels alright. Chalk up another courtesy camping experience — Wal-Mart, Cracker Barrel, and now Camping World. We’ll take Camping World as the best of the three judging on three hours experience (hmm, maybe you should check back with us for an update after a full night experience here?). We have this full power and a protected parking slip, this is pretty nice. But then a couple of pickup trucks pull into this parking lot — we see them zip across our front window toward the Camping World gated sales lot. We were finishing supper and ignored them. But as we were relishing the remains of the moment, admiring our empty plates, one of the trucks zooms past again toward the street. Then we hear a sort of roaring noise. Only from the back of our trailer comes this enveloping sort of whooshing noise. Jim runs back (yeah, two whole steps) and tries to catch what just flew by. Maybe the truck was spinning tires on the wet pavement and we, oddly, heard it? Oddly because we aren’t hearing cars driving by otherwise. Oh well, it’s over. In a minute or so here comes the noise again. Okay, we both rush to the back of the trailer to investigate. Good thing we aren’t a Bambi 16 footer or a 13′ Casita or Boler — we would surely have tipped it. Just about the time we arrive at the bedroom, the noise subsides. We return to the kitchen and then we hear it go by again. Is it interference in our XM radio station? We aren’t hearing it from the front speakers, so unlikely. We are in Boise, Idaho, for at least tonight and hopefully no more than two nights in hopes Camping World can remedy our refrigerator malfunction. You might remember our experience at Bucars RV near Calgary to have our refrigerator checked out. The RV refrigerator will operate flawlessly on propane but doesn’t know when to quit when on shore power. This turned out to be no big deal for our summer’s camping — we stayed in Canadian Provincial and National Parks throughout almost our entire Canadian experience except when a horrific storm drove us from Canada’s Glacier National Park into a nearby private park and when we visited Vancouver, BC, for a week. Our fridge stayed on gas our entire Tim Horton’s TransCanada Tour and would have anyway except for the two brief stays in private RV parks. We stayed in beautiful Bay View State Park near Mt Vernon, Wa, and in a pair of Washington state national recreation area’s campgrounds, one in the Cascades North and one near Coulee Dam. In the latter two we had no hookups and so no choice but to run the fridge on propane. What we’re saying is, this hasn’t been much of an imposition to have a fridge operating only on propane and not on 110v electric. Our friends, Bob and Faith Simms, invited us to visit them in Garden Valley, Idaho. We arrived at their house Friday after a very nice and beneficial drive through Spokane (I’ll get back to that) and an interesting couple of days in Clarkston, Idaho (and I want to tell you later about this too). We have enjoyed a couple of very relaxing, if much cooler than anticipated, days in their small riverside RV park. Both nights have been close to 31 degrees, and today’s high was 45 degrees (Bea, I have now stopped dual (F and C) temperatures :-) And we awoke to snowfall gently and wetly falling on our RV. If it was dryer it would have been a dusting — it wasn’t dry at all. Jim and Bob spent a good part of the day sitting by, and feeding, Bob’s outdoor fireplace and talking. Debbie made oatmeal-raisin cookies in our little oven, and caught up on our bookkeeping. And we hitched up and left for Boise a little after 1600 hours so we could locate our spot and set up in Camping World’s courtesy spots before dark. Our service appointment is tomorrow morning and we are full of hopes they will detect the problem promptly and accurately and have the parts on hand and repair our fridge. If not, we’re still on propane — no problem. What about the mystery noise emanating from our bedroom? A noise like this could drive us batty. We hear little noises from time to time. We recognize most of them soon if not at first. Some noises we don’t perceive until the radio is off, the lights are down, and we are putting our heads on the pillows. The quietest time of the day — and then a clicking noise, or a drip, or a rattle or squeak starts. And Jim will listen a minute or two and hop out of bed to track it down. Luckily this noise continued long enough for us to resolve before bedtime. Jim was staring out the upper porthole window in our washroom and spots Camping World’s lawn sprinklers irrigating the lush grass behind the adjacent motor home. 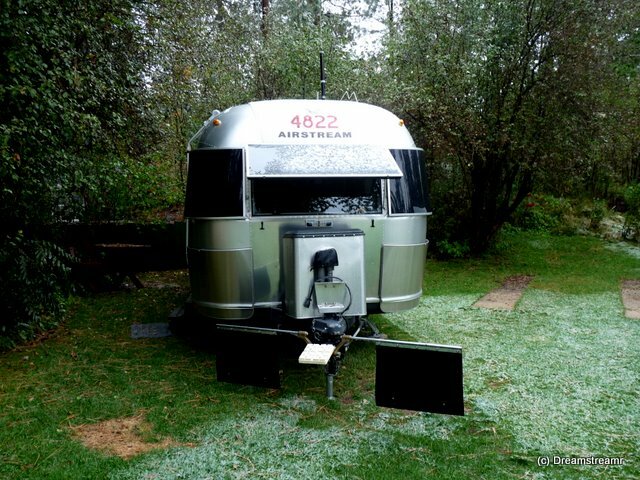 He quickly realizes the water spray from the revolving irrigation sprinkler is periodically and regularly cycling the rear exterior of our Airstream’s aluminum skin and resonating with a smooth whoosh sound. Mystery solved!